Cheryl Bippus resides in Michigan with her husband of over 25 years and three children. She received a Bachelors Degree in 1988 in Health Information Management and has kept up her certification, however has chosen to stay home to be with her children. Cheryl has been a Christian since 1991 and grateful to be able to homeschool as well as pass Christian values onto her children. There are many circumstances that come up in raising a family and life in general. The Holy Spirit gave Cheryl these words in poetry to encourage her in her walk. She did not share them with anyone. However, the Holy Spirit kept nudging her to share them to encourage others as well. So by faith, she took her handwritten poems and typed them to be ready to publish. As soon as she had them together, The Lord provided a wonderful publisher who accepted her manuscript. God is Amazing! Cheryl's hope is that these poems will bless and encourage you and draw you closer in your walk with Him. What is poetry? Poetry is the beautiful essence of words and emotions using literary expressions. 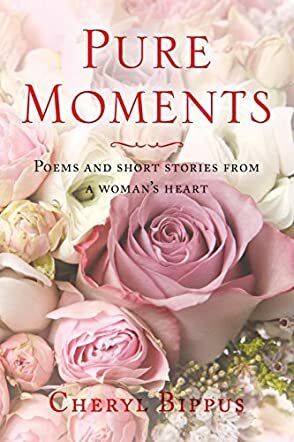 If you love to read words and envision them forming in your mind, embracing your spirit and engulfing your body, you will enjoy reading Pure Moments Poems and Short Stories from a Woman's Heart by Cheryl Bippus. In this collection you will have the pleasure of experiencing works of expressive poems as Cheryl has lived them. You will see how each poem is personalized with either a person the poem was directed to and/or the date it was written. Cheryl's poetry formulates an awareness of life from love, death, seeking forgiveness and the wonders of childhood to the beauty of nature. A special touch is how Cheryl not only connects these poems to the heart of a woman but in relationship to God. I loved these poems because of how they impacted me. The poems like Joy; Laugh, Giggle, and Play; Winter and Lady Bug, Lady Bug gave me a personal touch of how, if we look around, we see the beauty of life and what God provides to us through His wonders. I am in awe of everything. These poems and this book display how special words are because they encourage, inform and touch in so many ways. Feel these spiritually inspired words from Cheryl: “He can restore me fully, completely it’s true. He can use anything for good. Especially, heartache or pain. He wants us to be honest and real so we all can gain.” Add this book to your library so that you can read it when only words can help you to get through.